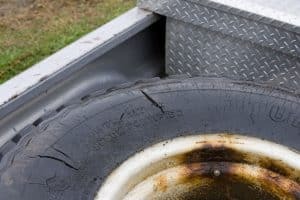 Sidewall Tire Damage – When do I have to replace the tire?Sidewall Tire Damage – When do I have to replace the tire? Having a puncture can be frustrating for the motorist. However, getting one does not mean that you need to purchase a new tire. Most punctures can be fixed by placing a rubber seal on the inside of the tire. The location of the puncture on the tire will also determine whether to replace it or repair it. Before you start repairing a tire ensure that your valve is not leaking. Improperly repaired tires are a cause of road accidents. Tires have different components. The part that is in contact with the road is called the tread. Belts are rubber layers made of fiberglass, steel, and rayon. The belts hold the plies. Grooves are spaces within the tread that allow escape of water. On the side, we have the sidewall. Most repairs are limited to the tread area. You should observe the size of the puncture – those beyond ¼ in diameter should be avoided. If you experience a sidewall tire damage. It’s not recommended to either drive with your car or repair the tire. When you have a sidewall tire damage, it’s recommended to replace the tire. The materials used to make the sidewall are softer than the tread. The purpose of the sidewall is to provide a smooth ride by absorbing shock. The rule in tire repair is that whenever you have a puncture on the sidewall – no matter how small – you will be forced to purchase a new tire. The sidewall puncture often expands and can cause serious accidents if repaired. If you are looking for a new tire, you can check out this tire review here of the best all-season tires. After observing your flat tire and realize that you have multiple punctures each more than 16 inches apart then it is time to purchase a new tire. There moments when the driver notices that they have a flat tire but decide to ride on with it to the next service station. Once you get to a safe place dismount the tire from the rim and inspect it. If you have ridden on the flat tire for long distances, you will notice and erosion of the outer and inner rubber. This tire is no longer in use, and you will need to purchase a new one. Riding on a flat tire also causes significant sidewall tire damage. If you have gone for road trips on rough roads, you would have noticed some “bubbles” forming on the sidewall. Pinch shocks form when the inner and outer rubber separate. Your tire is weak and can burst at any time from continued use. 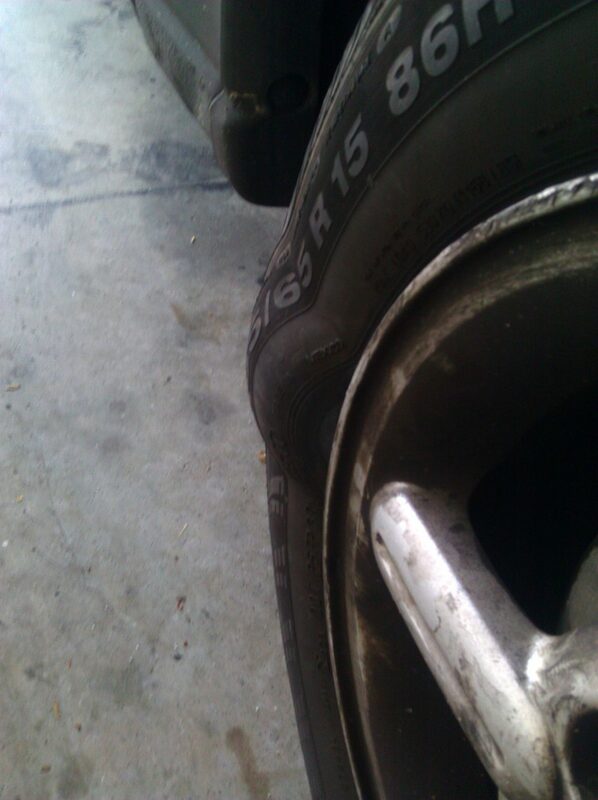 There is no quick fix solution to this type of sidewall tire damage, and you will be forced to purchase a new tire. This is the area where the sidewall meets the tread. A tire tread has some rubber, steel rings, and fabric belts. A careful examination of the tire will reveal that these are not evenly distributed. If the tread separates from the inner rubber along the shoulder, then your tire becomes unusable, and you replace it. After continued use, a tire gets worn out. You will notice that the tire surface has become very smooth and the steel rings are visible or protruding. At times bubbles will form along the tire surface. These signs mean your tire has run its useful life and it is time to replace it. If you are constantly going to the service station for air refill, then your tire could have a slow puncture which when ignored will lead to further damage of the tire. The puncture could be small and immediate action could save the tire from further degradation. If you do not immediately seal your punctures it will lead to tread separation and with time the tire becomes unusable. This is a problem for those people who do not use their cars frequently. Tires that have been used for more than 5 years are also susceptible to dry rot/sidewall cracking. The visible signs for dry rot are small cracks that appear on the side of the tire. As stated earlier sidewall tire damage requires that you immediately replace the tire when you notice a puncture. The sidewall cracks lead to the escape of air, and this leads to frequent flat tires. If you do not drive your car frequently, you may need to cover it to prevent sidewall cracking due to direct sunlight. You should note that polymers that makeup tires are often broken down due to UV. If you have been using your tires for more than 10 years, then expect some dry rot. It is recommended that you check with your state for tread recommendations. If your thread has gone below 0.16 cm, then your car is no longer safe on the road due to unexpected tire bursts. Check for tires where the tread bar is flush with tire tread. When you purchase a tire, you will notice horizontal bridges that are used to drive out water from the tire surface. Once this becomes flush with the tread, then it is time to replace that tire with a new one. Don’t check one side of the tire but make your decision on the whole surface area of the tire. There some shops that sell a tread depth indicator and you can use this to check how worn out your tires are. Each country and state has its own recommended tread measurements, and you need to know it to avoid arrest. The tread depth indicator is placed in the middle of one of the grooves in the outskirts of the tire. Having a tire burst can be scary for some people – especially when driving at night. But, this does not necessarily mean that a puncture is the end of your tire lifespan. If the puncture is as a result of sidewall tire damage, then you need to purchase a new tire. The sidewall is very sensitive, and no punctures can be repaired on it. Multiple punctures may also necessitate you to purchase a new tire – especially if they are inches apart. If you have any questions about sidewall tire damages, leave a comment down below!